Get everybody putting the organization first and success should follow. Do you believe that a competitive spirit is good for a business? Most entrepreneurs and managers would agree that competition is a good thing. In the US, competition is usually seen as one of the foundations of society. It’s a free enterprise setup where people can choose what they want and others compete to provide the products and services that others want. That setup usually leads to the best results. But competition is a balance. Businesses have setup competitive environments and the short-term results have been good, but there have been long-term consequences such as internal dirty tactics and things like that. You can also have a situation where there is a lack of competition within the company. People are just kind of going through the motions. That can lead a death spiral, even if it happens slowly, where the business loses its edge in the market. If that’s the case then it’s time to look at ways to put the competitive spirit back into your company. 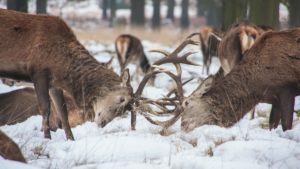 A big step to take when injecting the competitive spirit into your organization is to make sure the team members are focusing on the right opponent. It can be good to have some level of internal competition. More on that later. But really the competition for the business is to improve the business. If you want to be the best you can’t have a group of individuals out to improve only themselves. One person can achieve a lot in life, but a team can achieve much, much more. We see it all the time in sports and especially in the NFL where it’s difficult for an individual to control a game. Even the quarterback is only on the field for half the game. It takes a team to succeed. The teams that play the best together and have the most success seem to be the ones that put the team’s success first, ahead of their own success. You can’t eliminate individual motivation. People are wired to take care of themselves and those close to them, but you can work to motivate them to understand that the team’s success if their individual success. Some of the most successful businesses in history have had another business that they were competing against. I just finished reading Bitter Brew, which was about the Budweiser empire and part of the success of the company was that they were always competing against the other big brewers in the US. There was even an interesting point when Miller started coming out of nowhere to gain marketshare. Budweiser kind of ignored them for awhile, but eventually came around and extended their share of the market. The focus on Us (Bud) vs. Them (Miller) helped Bud to improve. And if you look at it from the other side, Miller’s, you can see that they probably pitted themselves agains Budweiser and that helped them achieve new levels of success. So finding a common enemy can be a good thing for your business. But it’s also important to remember that maybe it’s better to look at it from the bigger perspective. When your industry is successful then you will be successful. That means that you can’t simply beat your competition to a pulp. In a way, you’re still in it together from an industry standpoint. I’m reading a book by Arnold Palmer right now and he seemed to understand this balance. In tournaments he definitely wanted to beat the other golfers. But he was also very respectful and helpful with them. He knew that if the players were better as a whole that the game of golf would be better off and attract more fans. I read a good article recently about the danger of perfectionism. Shoot for the moon. Even if you don’t get there you’ll still reach the stars. You could take that to mean that it’s always best to aim for perfection. Even if you don’t reach it you’ll still be doing pretty darn well. However, it seems like a balance is needed and it almost sounds contradictory. It’s been found that setting big goals is a good thing, but you still need to be realistic about it. You still need to appreciate the good things that are achieved. So when you setup the competitive spirit in your company you can set big goals while still appreciated the successful steps along the way. It’s more of a constant improvement mindset instead of one that focuses on perfection or failure. With all the focus so far on being a team and beating others outside the company it’s still important to look internally for competition. Your team can work together to succeed, but that still requires some internal competition. Back to the idea of NFL teams. The teams that seem to succeed are the ones that are always looking to improve each position. They look to have competition at just about every level of the organization. If there is an opportunity to bring someone in that might improve things they do it. Nobody likes to feel threatened, which is what happens if a new player is brought in to compete with an existing player, but the best teams pitch this to the team as being a way for everyone to improve. Regular competition is good for an organization. Sell it as a way for the organization to always be improving. Make it an expectation and part of the culture. Finally, it can be good to boost the spirit from time to time to have internal competition. An example might be a sales competition or a project competition where teams work to compete a project faster than the other. I say occasional in this situation because companies have gotten into trouble with this type of Us vs. Us competitions. It can lead to good things in the short-term, but can break morale and spirit in the long-term. The competitive spirit has been part of successful companies for awhile. But it takes the right focus for things to work out. Companies have struggled with too much Us vs. Us competition. Focus on the bigger picture. Focus on common enemies, but also the improvement of your industry. Think big when it comes to competition. That’s the best way to get your team on the same page and working together to achieve great things.